I was born and raised in Coral Gables. I have a law degree from the University of Florida. I own property on Miracle Mile. And I work as a real estate agent. JOBS! We CAN bring new businesses, and new jobs, to Coral Gables, and I have an entirely feasible plan to do this. LOWER TAXES! I have worked fastidiously for the past five years on lowering, or at least slowing the growth of rising, property taxes. I have had some notable successes in at least slowing the rise of property taxes. If I am elected, I will reduce property taxes from what they otherwise would have been. Coral Gables residents and businesses are entitled to lower taxes in The Great Recession! I seek to revitalize the downtown Miracle Mile and Ponce de Leon business sector with department stores, which allow lateral, not vertical, growth of our businesses, to strengthen our City's tax base, without the urbanization of skyscrapers which reduce Coral Gables' residential charm and character. I believe your Spending Priorities should control how your tax money is spent! So far as I have been able to determine, voters Budget Priorities are A. Police, B. Fire, and C. oddly enough, trash pickup. I promise you that Your Budget Priorities will be my Budget Priorities! PLEASE LET ME KNOW WHAT YOU WOULD LIKE TO SEE ACCOMPLISHED AND/OR IMPROVED BY OUR CITY GOVERNMENT at contact@ripholmes.com . Please watch my opening remarks in the recent debate. 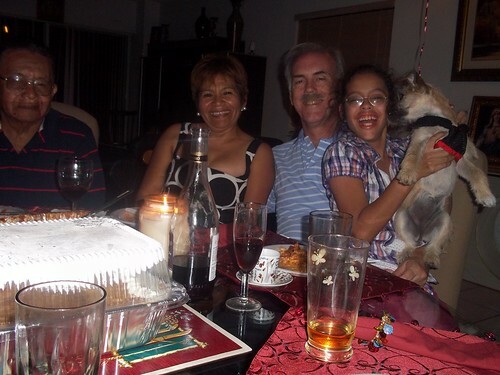 Papi Alfonso, Gaby, me, Angie, and our family dog, Ginger.